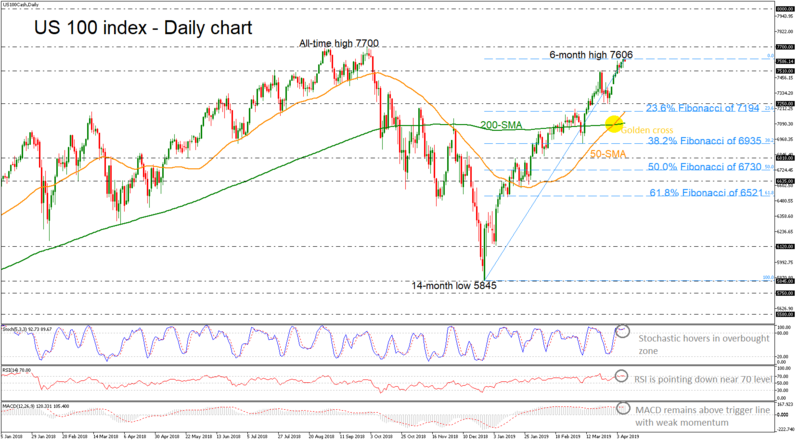 The US 100 index continues to print higher highs and higher lows in the daily chart, running to fresh six-month highs ahead of the all-time high around 7700. However, the technical indicators seem to be overstretched, suggesting a possible downward correction could be near. Specifically, the stochastic oscillator is hovering in the overbought zone, while the RSI has found resistance near the 70 level and is pointing down. Also, the MACD oscillator still stands above its trigger line with weaker momentum than before. It is worth mentioning that the 50- and 200-simple moving averages (SMAs) completed a ‘golden cross’ in the near term, but the 200-SMA is still flattening. If the bulls stay in control, the next resistance level to watch is the all-time high, before heading towards the psychological level of 8000. On the other side, if momentum indicators prove that a bearish retracement is near, immediate support is coming from the 7510 level, while a move below that could see sellers challenging the 7250 barrier. Another sell-off could turn the bias to a more neutral one, opening the way for the 23.6% Fibonacci retracement level of the upleg from 5845 to 7606, near 7194, which coincides with the 50-day SMA. Overall, the near-term picture remains cautiously positive, though a corrective pullback may be on the cards in the immediate term.